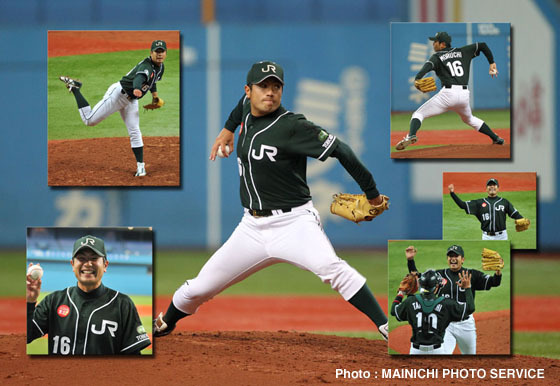 OSAKA -- For amateur pitcher Toshiharu Moriuchi, who hurled a perfect game for his JR East Tohoku team in the 82nd Intercity Baseball Tournament on Oct. 24, victory was not just sweet; it was proof of the triumph of will over adversity. "I wanted to prove that, even after the earthquake, if you try something you can succeed." 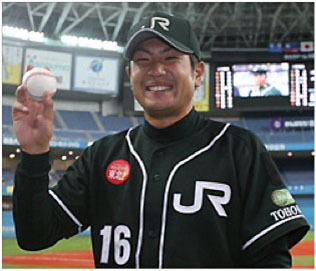 Moriuchi, 26, said with a big smile after the game. Moriuchi's East Japan Railway Co. (JR East) Tohoku team is based in Sendai, which saw terrible damage in the March 11 earthquake and tsunami. "He really put on a display of Tohoku's reserves of strength," said one of many disaster survivors in the stands at Osaka's Kyocera Dome who took in Moriuchi's record-setting performance.